Yesterday we had one of our increasingly infrequent days out. We went to Gloucestershire for reasons I will tell you about later in the post but it was a day of ups and downs. Now if there's one thing I like better than a wool shop - it's a wool shop with a sale on. Aaaagh! 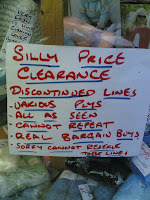 A wool shop with a sale on - that's closed for the day! The fates are conspiring against me. How am I ever going to get inspired and recover my knitting mojo. The charity shop gods were not on our side yesterday either and pickings were slim in Cirencester and later in Gloucester. We enjoyed mooching round though and had a cup of coffee or two. The main purpose of our visit to Gloucestershire was to go to an auction. Those of you who have been long-time readers of the blog may know that we used, in a previous existence, to be second-hand bookdealers. In those days it was not uncommon for us to go to three or four auctions in a week. Now that we're not dealers any more we hardly ever go to an auction. Yesterday though the auction was so special that we really just wanted to go and look at the stuff that was being sold. We thought we might buy a couple of bits if the prices were right - it was Pete's birthday this week and he collects British comics and comic art. Dominic Winter are primarily a book auctioneers but a good proportion of yesterdays sale was British comics, artwork and related books. It was the sale of someone's collection - his life's work by the look of it, and what an amazing collection it was. There were thousands of beautiful comics, and many many lovely books and a couple of lots that we really wanted to buy (including one that included a couple of boxes of Textile History journals that I had my eye on). Sadly we came away with nothing. It seems that the secondhand book and comic market is not suffering from much of a recession. The prices that some of the lots sold for were astronomical. We were astounded. We came away a little sad that we hadn't managed to buy what we wanted, but also relieved that we were no longer competing against all that to try and make a living.